There are more than 350,000 applications in the Apple App Store and you’re starting to get that tingling sensation that you may be the last person to join the party. Even if half of the applications should have never made it out to the store (do we really need another glowstick app?) it is definitely a playing field that needs to be explored and understood. In this blog post I will explain the differences between the App Store Apps and the iPhone / iPad optimized websites that are also called WebApps. The App is a piece of software that is written on the iOS platform, has to be built on a Mac, go through the iTunes approval process and will then finally end up being sold or distributed for free in the iTunes Store. There are several advantages and disadvantages associated with the App. Can be designed for a wide range of uses - games, business productivity applications, media applications, time management, and others. Some of the more complex and graphic intensive functionality cannot be delivered over Web Apps. Can function without Internet connectivity - once installed the application resides on the device and does not require a signal to work. Excellent when you’re in the subway and need to slash some fruits. Background operation – application can run in the background and send push notifications to the user.  For example – a task on the calendar can notify the user of a pending due date and so on. Can be sold through the iTunes store and have a subscription based service. And then you get to pay Apple on a recurring basis! Glee! Can directly interact with mobile device peripherals such as the camera, GPS, and touchscreen. Can perform complex operations on data without the need for server side code. In other words, you don’t have to buy rack space for your monster servers because Mike can now resize his profile picture on the device itself. Development time and cost is much higher than optimizing a website and creating a WebApp. To make application available to the whole market you will also need to develop Apps for the Android and Blackberry platforms. Code cannot be reused across the platforms. The application is harder to test for simple users – a deployment package needs to be installed on the device, devices have to be authorized for testing. App needs to go through Apple App review process. You need to share 30% of your total sales revenue with Apple. Every single bug fix will need to go through the Apple approval process which takes anywhere from 2 to 4 days on average. A website optimized for mobile devices is usually an “m” subdomain of a regular website which renders the web pages in a very specific way that is dedicated to mobile devices. You can see some of the more popular WebApps on Apples website. The functionality is somewhat limited to web technologies but with the spread of HTML5 this is becoming less and less of a problem. Lower development time and cost. Since the mobile web app is essentially a different front end for you website the development cost is much lower than that of the App. We are currently creating a mobile optimized website for GoSarpinos.com and we’re able to reuse most of the code-behind and do just minor design work for the mobile pages. Cross platform scalability is easier: while you still have to account for slightly different layouts and capabilities of mobile devices such as Android and BlackBerry OS based phones, it is easier to do since all output is just HTML and the back end is controlled by your website (and not several development teams that work on different platforms). Testing is simple – it’s just a website you can surf from your computer. Does not have to go through Apple’s approval process and is not limited by their TOS. You can integrate analytics into the web application since it’s a good old webpage. Learn the amazing conversion power of shiny buttons! Application capabilities limited to web technologies – you can forget 3D games or processor hungry applications that heavily use touch and gestures. Cannot function without Internet connectivity – something that may be very important if you want your conference attendees to be able to get to their materials in dark and wet basements. WebApp can’t run in the background and cannot send push notifications. Can’t sell the WebApp through the iTunes store – less exposure, can’t get user reviews, and monetize unless you make the user register and pay through your website. Peripheral integration is not 100%, but getting there. 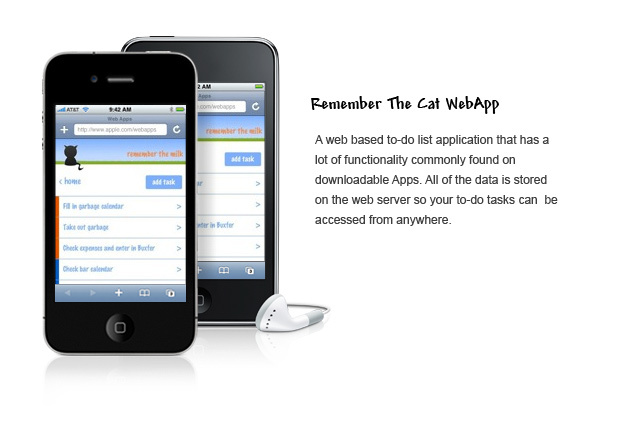 http://www.phonegap.com/ supports most of the features on multiple platforms. That being said – it’s not a solution for every business or task at hand. 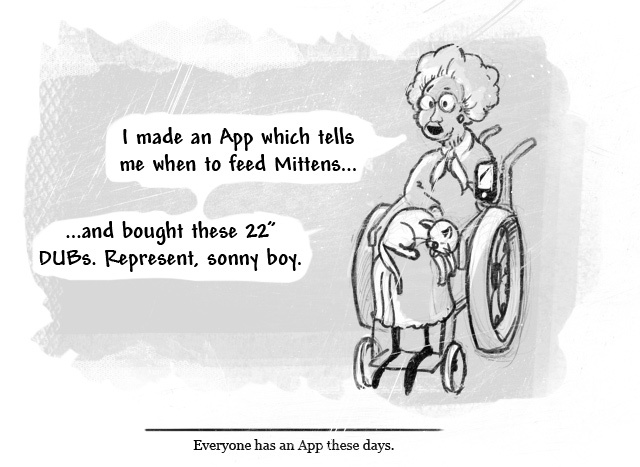 There are many applications that simply cannot be developed as WebApps and should not be. 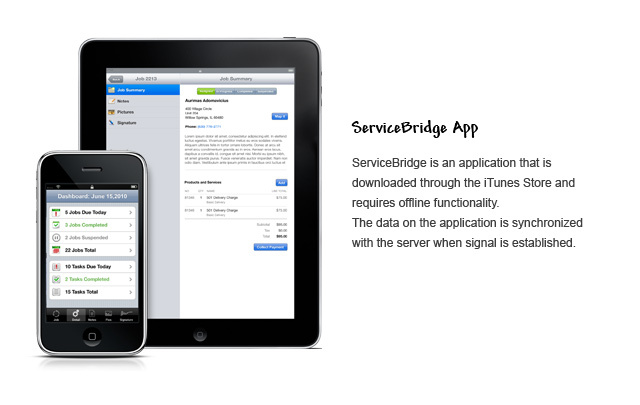 ServiceBridge, for example, needs offline functionality so that a technician could operate the device in areas where there is no wireless signal. The application allows to queue up the requested changes and then communicates with the server once signal is established. Contact us and let us know if we can help you find the right approach for you. We develop both WebApps and iTunes Store Applications and can set you on the right path.